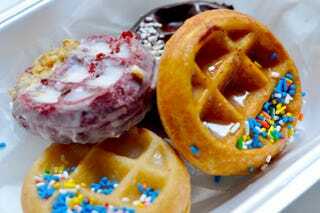 If you go to Chicago, don't forget to pass by Waffles Café to try this new gem of culinary frankensteining: The Wonut—a cross between a waffle and a donut that, according to some people, "it is indeed pretty good. Not exactly what expected from the taste, but by far some of the best waffling I've ever had." I really want two of these for my breakfast today.